Unagi: Delicious Past and Dim Future Unagi is one Japan's most delicious dishes. Too bad you won't be eating it for long. Eels: long and snakelike and slimy, they're hard to love. Unless, of course, they're grilled and basted with a sweet sauce. Unagi 鰻（） is a signature dish in Japanese cuisine. You've probably encountered it at least in sushi. But if you're American it's probably the only place you've had the chance to eat it. It's amazingly savory with a ticklish texture. Unagi done right will melt in your mouth. It's even said the smoke coming from unagi on the grill is good enough to eat with rice. Strangely, though, even if you're eating unagi in Japan, it may have spent most of its life in North America. 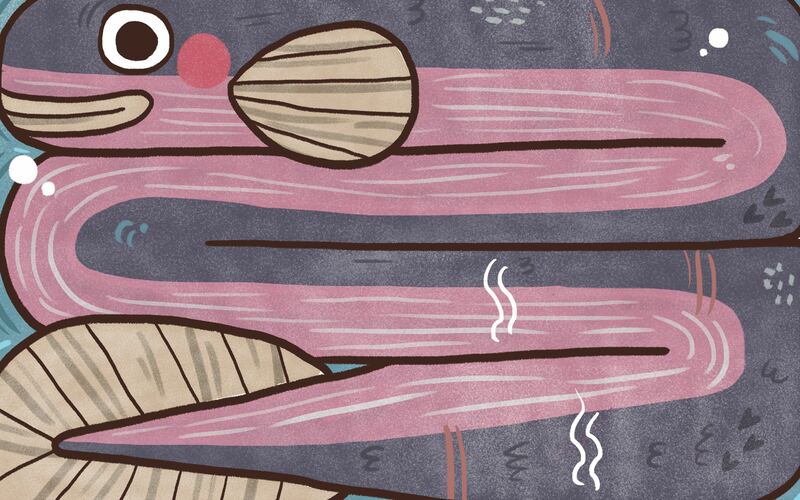 It's part of a long story which includes the unagi's strange lifestyle and the bad news about its dismal future. The traditional preparation of unagi involves grilling the fillets over charcoal, while basting with a sweet unagi sauce made from soy sauce, mirin, and sugar. Of course there are regional differences. In Kanto (eastern Japan including Tokyo) the unagi is grilled, then steamed to get rid of excess fat, then grilled again. In Kansai (Kyoto, Osaka and the west) there's no steaming. The unagi is grilled longer, making it crispier and chewier. There's also a difference in how the unagi is prepared for cooking. This is attributed to cultural difference in the regions (Kansai and Kanto can't get along). In Kanto, the eel is split open from the back rather than the stomach. Edo was the military capital, and the restauranteurs didn't want to remind their samurai customers of seppuku, ritual suicide which involves stabbing yourself in the stomach. In Osaka, the eel are cut down the stomach, supposedly because people there are more open and frank, inclined to "spill their guts." The grilled unagi is usually served with rice and pickles. Japanese sanshō pepper is also provided to sprinkle over the unagi. If you've never tried sanshō pepper, you should. It's an amazing aromatic spice unlike anything I've used. At a proper unagi restaurant, no part of the eel goes to waste. The guts are skewered and grilled. The liver is made into soup. Even the spine is deep fried and eaten like a crispy cracker. A traditional belief regarding unagi nutrition might have some basis in reality. It's supposed to be good to eat in hot weather to restore your energy. There's some truth to this because it contains various vitamins including B1, which is lost in sweat. To be fair, many other fish contain high amounts of vitamin B1. But I'm happy to have any excuse to eat unagi, so I'll leave it at that. Although unagi is eaten all summer (and the rest of the year too), the biggest eel-eating day is doyou no ushi no hi 土用（どよう）の 丑（うし）の 日（ひ） ( Midsummer Day of the Ox). This is supposed to be the hottest day of the year. The exact date is determined by the lunar calendar, so it moves around. But it's always in late July or early August, which gives the day a fair shot at being hot as heck if not actually the hottest. One legend says the custom began as a marketing gimmick. In eighteenth century Edo, an unagi restaurant hired a famous calligrapher to make a sign which said "Today is the Day of the Ox." People noticed the sign because of the fame of the artist. It was a celebrity endorsement. A connection between unagi and the date stuck in peoples' minds. Whether the story is true, the day works well as a marketing gimmick nowadays. Supermarkets in Japan set up special sections to sell grilled unagi for the day. The supermarket unagi displays sell it already grilled. This is because it isn't usually cooked at home. Sorry if you were thinking to try out an unagi recipe in your own kitchen. 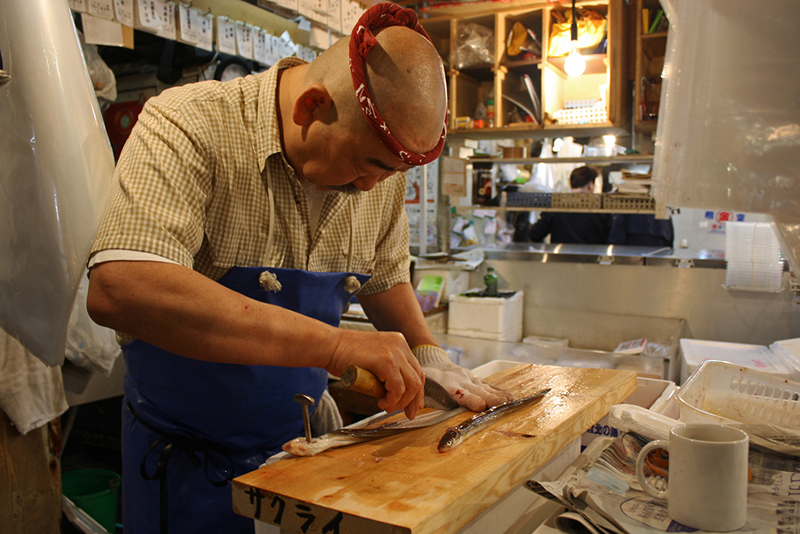 It's best to slaughter and fillet unagi on the spot with special knives. 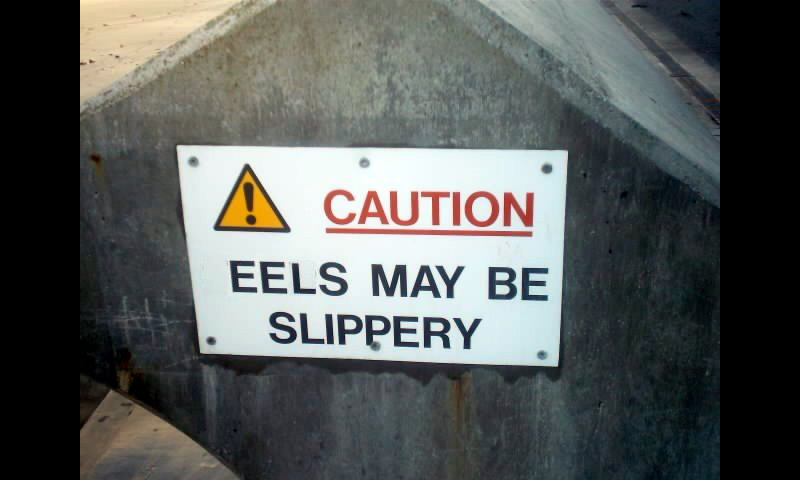 Since they're strong and slippery beasts, this is better left to experts. Then there's the unagi sauce. Restaurants have their own secret recipe passed down from one chef to the next. Apparently it's one of those things where the same pot is simmered and added to for years and years, something you can't reproduce at home. It's said if there were a fire, the pot of sauce would be the first thing the chef would try to rescue. I don't know if an unagi chef has ever successfully rescued his sauce pot from a fire. But I found a story of one person who wasn't able to grab their pot in an emergency and regretted it. There was an owner of an unagi restaurant in Fukushima. When the 3.11 disaster hit, he was devastated that the traditional sauce passed down in his family was lost. But the biggest reason unagi isn't cooked at home was a surprise to me. You've about the toxic liver of the famous fugu blowfish and how chefs need a special license to prepare it, right? Apparently, unagi blood contains a neurotoxin and also needs special preparation. That's why unagi is never eaten raw. Even unagi sushi is made with grilled unagi. Less than one cc of the toxin can kill a rabbit. And you don't want to get it in a cut or in your eye. It doesn't take much to kill a person, either. I couldn't find the exact amount. But if I ever get to watch a chef prepare a live eel for me, I'm going to play it safe and sit a ways back. Cooking neutralizes the poison though. So unlike fugu, there are no worries about eating the cooked unagi. 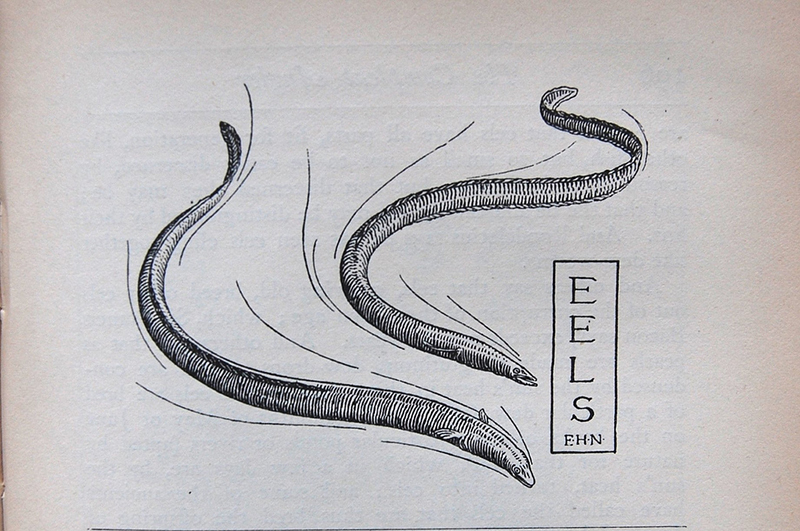 The eel has an unusual life cycle among fishes. It involves an amazing long-distance migration. In English, unagi is called "freshwater" eel, in contrast to anago 穴子（） the "saltwater" or conger eel. But this nomenclature is somewhat misleading. Unagi, despite being "freshwater," spend a large part of their life in the sea. They are born in the middle of the ocean, then find their way to the coast and enter rivers and streams. There they live for ten to thirty years. Finally they swim back out to sea to spawn. It's still unknown how unagi find their way from the middle of the ocean to the mouths of rivers they've never seen. Most migratory fish go the other way round, like salmon: born in a river, they go out to sea, then return to the familiar river they came from. Much of the unagi's life cycle was a mystery until recently. Naturalists have been coming up with theories all the way back to Aristotle. He thought they emerged from mud. Pliny thought they reproduced by rubbing against rocks. You can't blame the guys for being creative, though. When eels were dissected, no sexual organs were found, since they develop only after the eels leave the rivers and head for their spawning grounds. Another thing made it hard to figure out the unagi's reproductive story. The young look nothing like the adults. 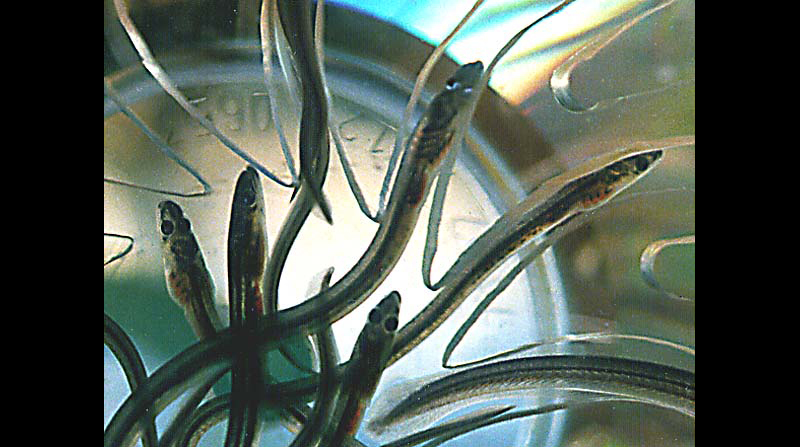 Called elvers or glass eels, they're tiny, transparent, and shaped more like a willow leaf than like their snakelike parents. In fact, when first described in 1856, they were considered to be a different species of fish altogether. Not until forty years later did two scientists see one metamorphose into an adult (in a fish tank) and realize they were different forms of the same fish. The European eel looks so different at different times in its life that at one point, forms of the same species had thirty different names. And of course, the long distances unagi travel and the huge size of the ocean made studying their life cycle a challenge as well. The spawning grounds of American and European Eels in the part of the north Atlantic west of Bermuda called the Sargasso Sea weren't discovered till the 1920s. The spawning grounds for the Japanese eel were only located – after 60 years of searching – in 1991 near Guam and the Marianas Islands. Although it is generally agreed by the Japanese people that the Japanese species is the most delicious, Japan now gets about 80 percent of its unagi from elsewhere. 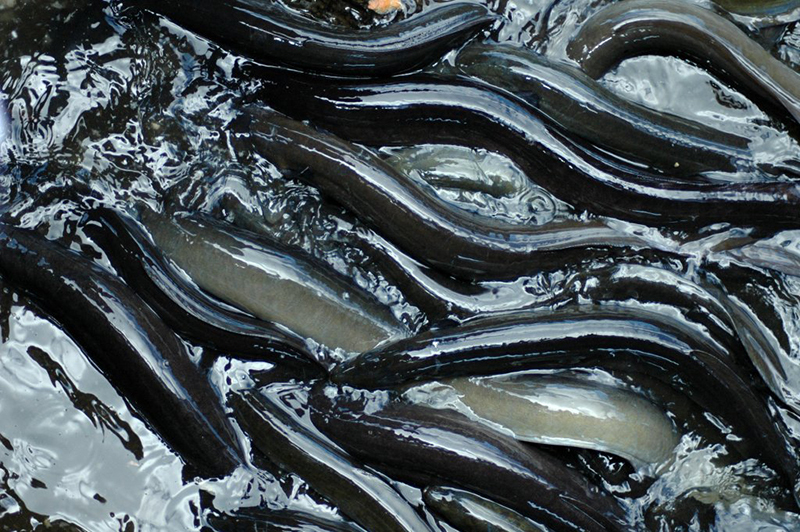 The simple answer to "where" is "eel farms mostly in China and Taiwan." But the full story is more complex. In the early 1990s, populations of the Japanese eel became so small (and prices so high), suppliers began to look elsewhere. They discovered similar species lived in Europe and North America. And even better, in North America no one cared about them. So there was no limit on how many could be caught. The complication was the need to get them to market alive. It's a long way from the East Coast of the U.S. to Japan. So what developed was an industry that catches the tiny juvenile glass eels, ships them to Asia, and raises them to market size in fish farms. 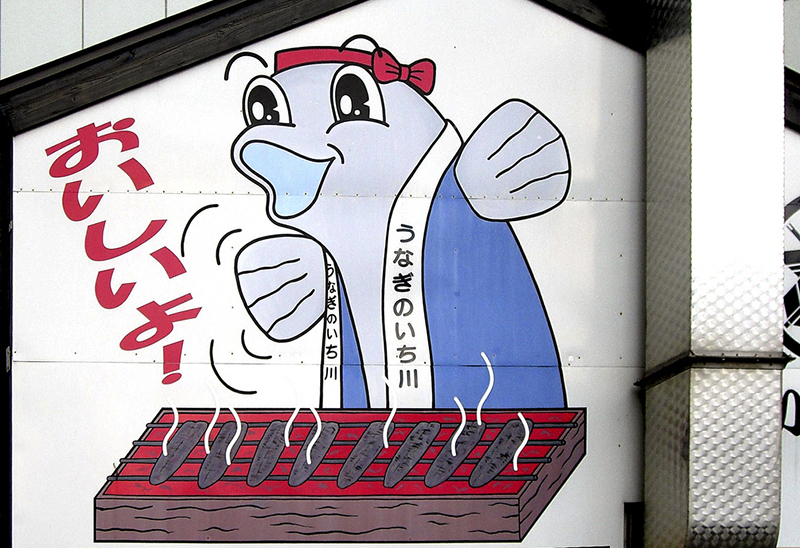 Today, the small amount of Japanese eel consumed is also mostly raised in farms. Less than one percent is wild unagi caught as adults. The most prized are from Hamamatsu, which sell for double the price of the imported ones. It's no surprise this has attracted dishonesty. Some suppliers have been arrested for falsely labeling eel from China as unagi from Hamamatsu. 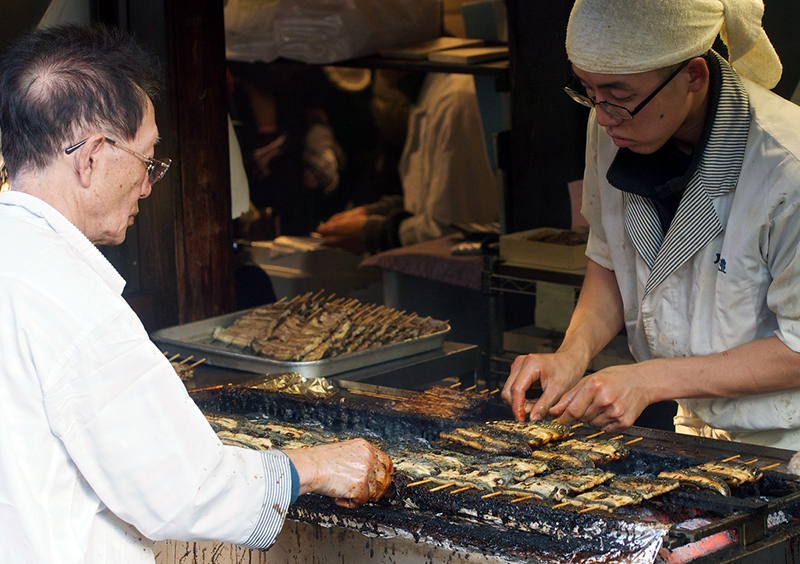 The decline of the Japanese eel has also resulted in crime in the U.S. When Asian suppliers started to buy North American eel, the fish went from almost worthless to a virtual gold mine. Glass eels are now worth up to $2,600 a pound. 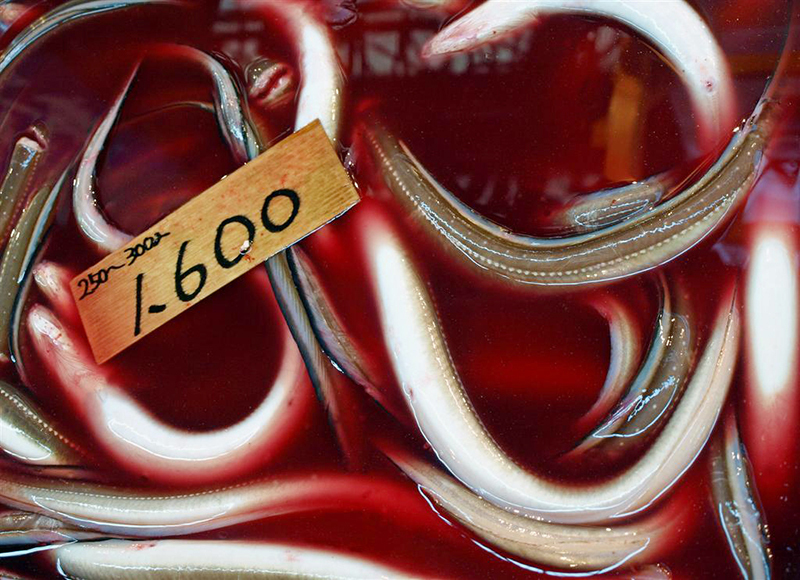 In 2013, Maine fishermen caught more than 18,000 pounds of the tiny eels, worth about $33 million. Great for the economy, right? Except now there are poachers, turf wars, armed guards watching over tubs of glass eels, fights about the local Pasamaquoddy tribe's sovereign fishing rights, huge amounts of cash attracting criminals including drug gangs. Long story short, it has gotten to the point Animal Planet made a reality show about Maine eel fishing (this is the Animal Planet that claims mermaids are real, in case you're remembering the time they made educational material). Belatedly, the Japanese government recognized the issue and tried to help our unagi friends. In early 2013, the Ministry of the Environment added Japanese eel to its Red List of endangered fish. Statistics cited include the 90 percent decline over the last three generations and populations are 5 percent of what they were in the 1960s. Nice that they have finally taken notice. But unagi's inclusion on the Red List doesn't result in any kind of fishing ban, and regulations are only being "considered." The problem is even more pressing because it's not confined to Japan. 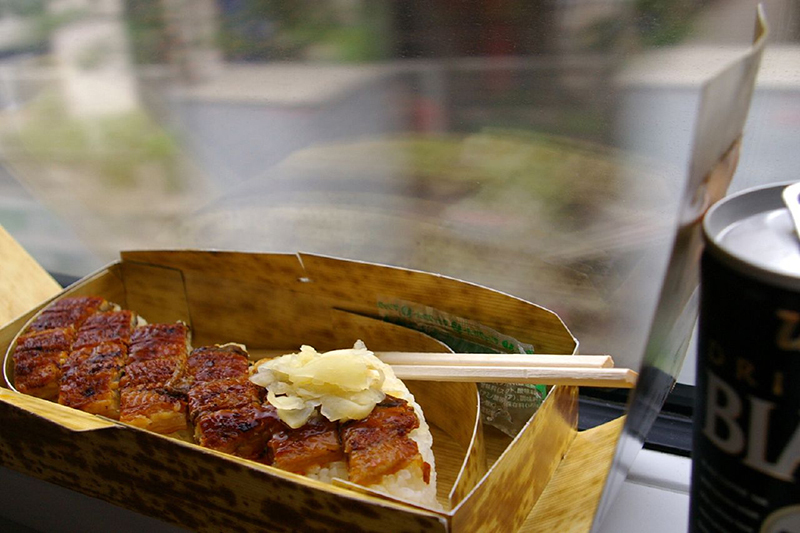 All other unagi eaten in Japan are also declining. European eel are dropping in large numbers, including in London, home of the jellied eel. In the River Thames, the population was reported in 2010 to have fallen by 98% in the previous five years – from 1,500 in 2005 to just 50 in 2010. And although the numbers of eels caught in Maine are mind-boggling, they're declining in North America as well. Canada has declared them endangered in Ontario and the Maritime Provinces. Although an attempt to list them as an endangered species failed in the U.S., fishing for glass eels is only legal two states, Maine and South Carolina. Maine has introduced fishing quotas, and they're serious about it. This year, limits started to be enforced with an electronic swipe card system which will allow regulators to monitor how many eels are being caught daily. Is unagi in danger of disappearing from our plates? It's generally agreed the species can't sustain our habit of robbing the cradle of tons of their babies every year. The most respected organization which evaluates the environmental impact of the fish we eat, the Monterey Bay Aquarium Seafood Watch, says unagi is one of the species you should avoid if you care about sustainability. But this doesn't seem to have had any effect on whether restaurants offer it. They've been saying the same thing about tuna, and it hasn't affected the menu at any sushi bar I know of. As I was finishing this article, some news broke: the Japanese eel was declared to be an endangered species by the International Union for Conservation of Nature. This is a big deal, because the IUCN's Red List is the recognized international standard for what counts as an endangered species. Like the Japanese national red list, it doesn't automatically mean fishing is regulated. But it's taken seriously when international trade regulations are negotiated. And, as one restaurant owner said to a reporter, "We are already losing customers because of the rising prices. Now, consumers might feel guilty about eating a red-listed species." Researchers are at work on the obvious solution: figuring out how to breed unagi in farms from the start. But this hasn't been easy. Eel eggs were first successfully fertilized in a lab in 1973. But it took till 2001 for scientists to figure out what the fussy baby unagi would eat (which turned out to be a slurry of freeze dried shark eggs. Mmm!). They didn't get any of them to live long enough to grow to full market size till a few years ago. And still, only 1 percent of fertilized eggs survive even to 100 days. And this is a fish that can take a couple of years to get big enough to sell. Of course for all we know, that could be the natural survival rate in the wild. But for market production, it's a long way from economically viable. And then another problem is for some unknown reason nearly all the fish born this way are males. This is pretty much backwards from what you'd want. You can get by with only a few males, but you need the females for eggs to make more baby eels. Scientists are working to solve these problems, and we better wish them luck. Because sadly, the way it's going now, eventually we'll all be telling our disbelieving grandchildren about how we celebrated Day of the Ox in the good old days, eating our fill of luscious grilled unagi. 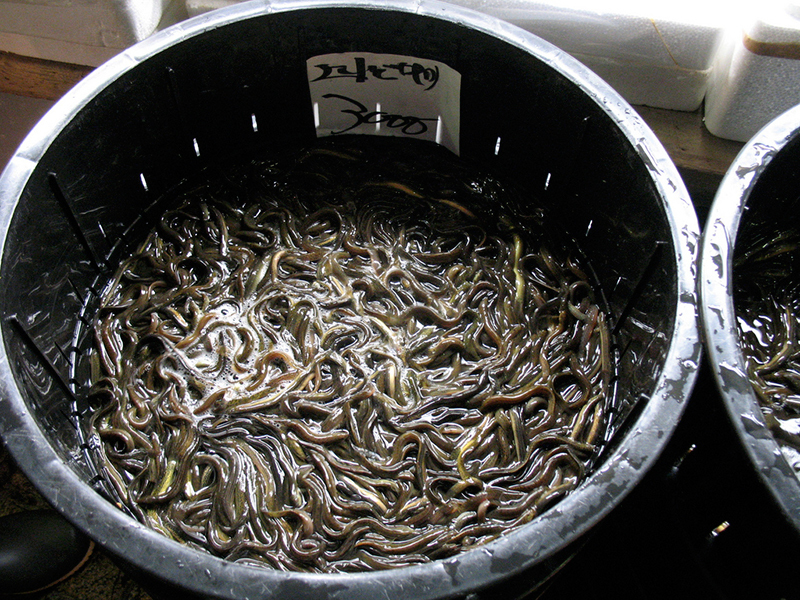 Why should Asia harvest the long-term elver profits?